Leicester is a city situated in the East Midlands of England the River Soarand flows through the city and is at the edge of the National Forest. 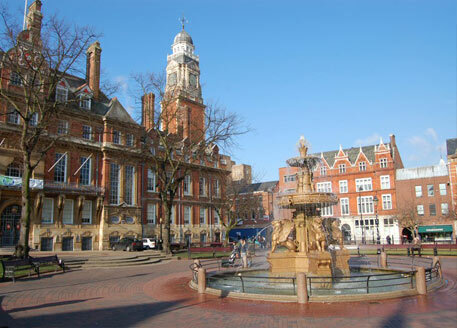 The population of Leicester is over 500,000 and is the 10th largest city and one of the oldest cities in the UK. Leicester has a rich history and the majority of original buildings, pavements and baths are still standing today. The city of Leicester is mentioned in the ‘Doomsday Book’. In the 19th century a new rail and canal network through the area improved industrial growth thus making Leicester an economic manufacturing centre with engineering, shoemaking and hosiery production. This lead to expansion into the surrounding urban and rural areas with the construction of factories, mills and workshops. Leicester is 13th in the retail shopping league in the UK. With two major shopping centres; The Haymarket Centre and The High cross Centre with department stores, designer shops, high street shops, and shops selling traditional and local produce. The city has theatres, cinemas, galleries, a museum, and monuments. There is an abundance of restaurants with a diverse and multicultural cuisine catering for every palate. Leicester has Botanic Gardens, a City Farm, a Canal, a River, Country Park and Parks and a National Space Centre. The city has local sports clubs which include; Leicester City FC, Leicester Tigers (Rugby Union), a County Cricket Club, Speedway Racing and Athletics Club. Leicester has excellent transport links. A good local bus service provides links around the city and the surrounding suburbs with National Bus Services offering links to towns and cities further afield. A good rail network with connections to local areas, and trains to London, Birmingham, Manchester, Leeds etc. The M1, M69 and M6 motorway are all within easy reach. East Midlands Airport is situated to the north west of Leicestershire with flights to European destinations. Birmingham Airport is approx 50 minute drive and Luton Airport just over an hour away with flights to the Americas and worldwide connection flights. Leicester has excellent education facilities catering from pre-school to university level with both local education and private schools available. Leicester is a thriving town with a lot to offer thus making this an ideal time for investors to purchase make a property investment in Leicester in the much needed ‘buy to let market’.